Tower Regency Hotel @ Ipoh – Hands down one of the best hotel Ipoh has to offer. Spanking new (couldn’t be more than two years? ), well-designed, and at a prime location at that. It’s been ages since we last dined at any restaurants in hotels of Ipoh. Last I remembered we had a very cheap buffet lunch at Syuen Hotel; for less than RM15 per person (yeah, dirt cheap right?) but of course lah … you get what you pay for. Not exactly bad, for you get the usual appetizers, soups, rice and noodles, a few meats and several vegetable dishes, as well as a DIY Ais Kacang counter and some local delights of kuih-muih. But that was WAY back then … I think sometime beginning of last year. And not sure where I stashed those pictures, or did I even take any photos. Doubtful that they’re still running the same promotion as of now; what’s with all the increase in cost of living, inflation and the imminent preparation for something BIG come next year (you know the drill … Malaysia ma ...). Cafe@6 on the 6th floor (lame?) 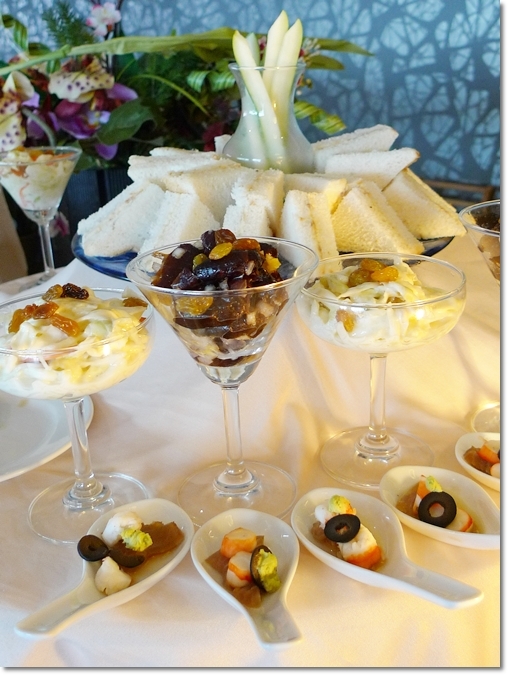 of Tower Regency Hotel – High Tea Buffet on Fridays and weekends only; for RM16/USD5.20 per person. Talk about being affordable? And since we have run out of place for a last minute gathering, we settled for an impromptu (almost) high tea session at Tower Regency Hotel’s Cafe@6. Only on Friday, Saturday, Sunday and public holidays. 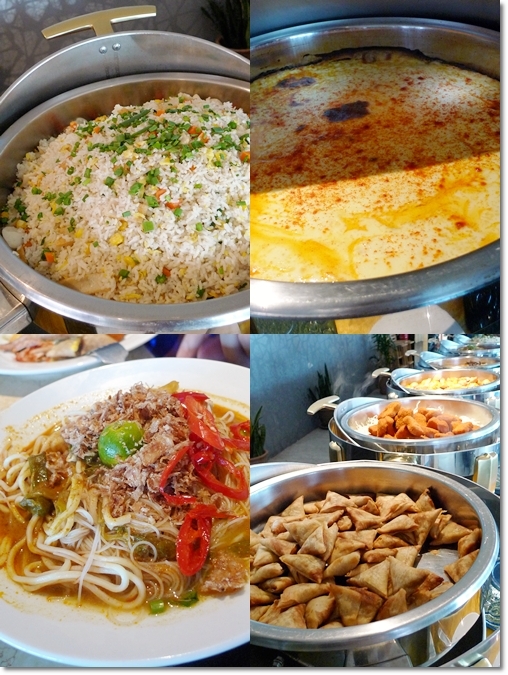 Can’t say this was the BEST high tea buffet in Ipoh, since I have not tried many others save for Casuarina and Excelsior WAY back then ……. but read on to see what they offer and whether the RM16‘s worth the effort. Lacklustre appetizers. Did not even know what’s the awkwardly slimy and cold combination on the individual spoons; but there was a cut of raw fish (or similar) there. 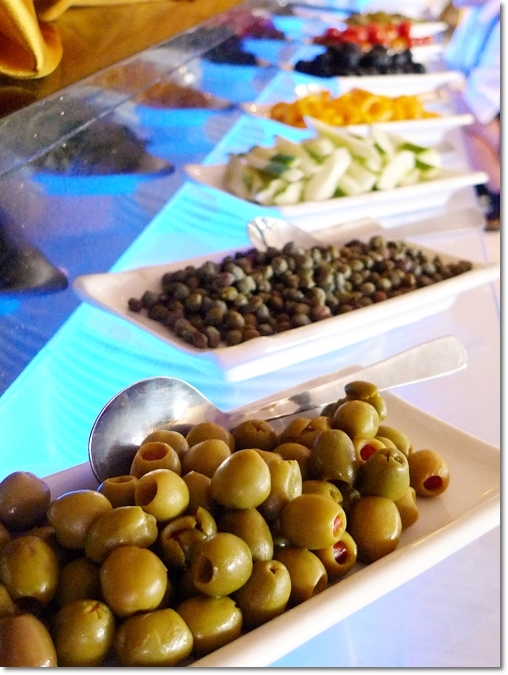 Green Olives and the rest of the Beauties. More like decorations than real food huh? 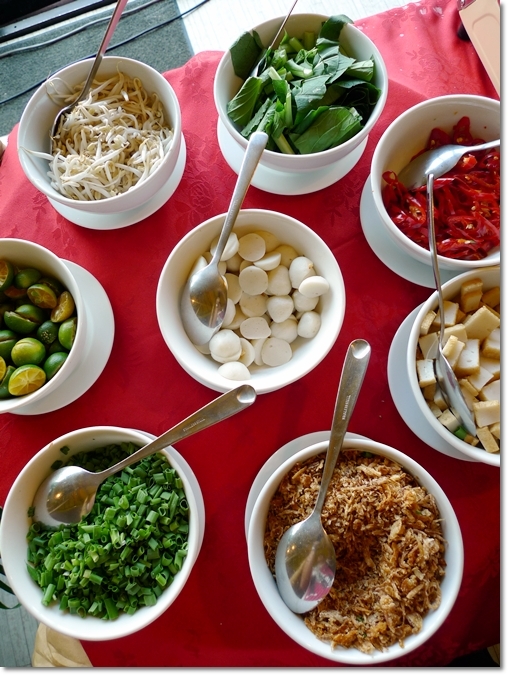 Condiments for the Curry Mee/Mee Rebus; a half DIY version but nothing spectacular. A sloppily done cold laksa noodles tossed with the usual condiments. As a salad I supposed. Highly suspicious of being leftovers from lunch, or worse … the day before. Fried Rice, Mee Rebus (or Curry mee? ), a potato gratin and the samosas and fried nuggets. Murtabak freshly made on the spot; on the hot pan. The sardine sambal was good, but the murtabak was not. And they’re supposed to serve thosai too, but somehow the guy was not exactly accommodating to our requests. Hmm. 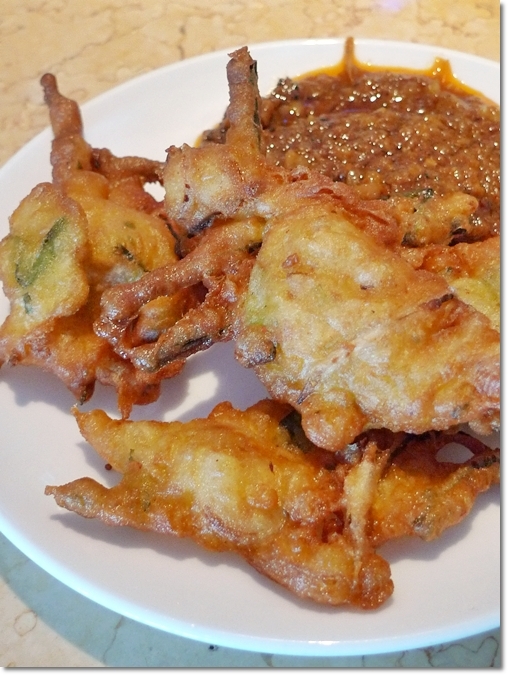 Cucur Bawang – All’s not lost. Possibly the BEST item of the day; the freshly deep fried cucur bawang (onion fritters) with a delectable peanut sauce deserves a mention and repeated consumption. We went back twice. Ultra thick & gamey mutton soup in a tangy tomato base. Very hearty, and not for one who dislikes extremely robust/gamey taste of the meat. 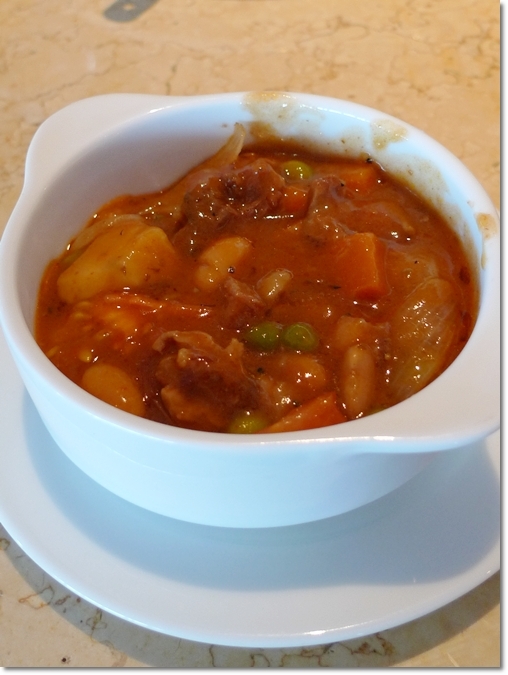 But I sure enjoyed this, a very traditional Hainan style of mutton stew even. 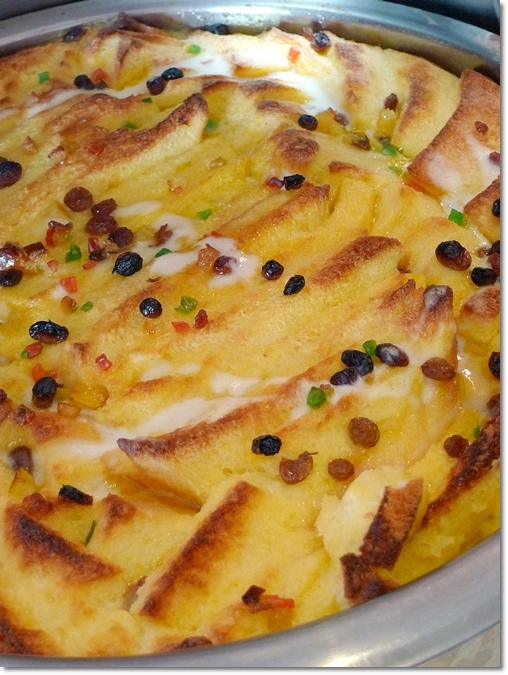 Bread & Butter Pudding – Possibly the best of the lot, but this ain’t saying much since the other desserts were nothing but the generic offerings. 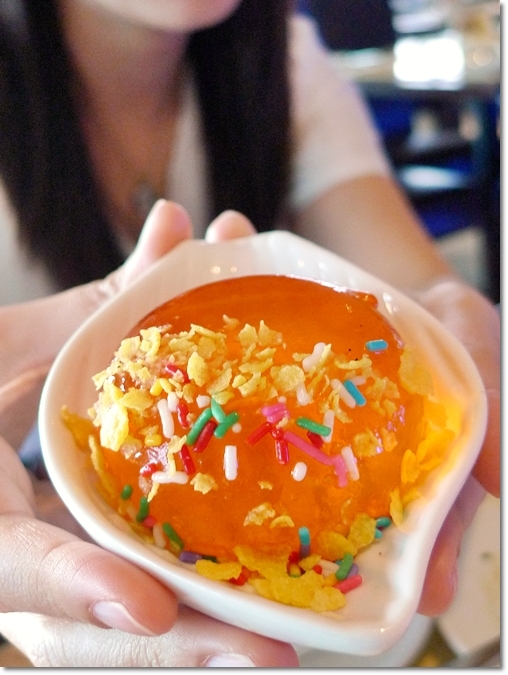 Not sure what to make of this, but the colourful jellies looked good enough for pictures, but not for eating. Hmm. Not sure if I am being slightly too critical here; nor my tastebud has gone haywire. You can argue that by paying RM16 per person, surely you don’t expect sashimi, oysters, freshly baked scones and all right? But at least, don’t serve us leftovers (there were more, especially at the cold appetizers counter), and mediocre/bland selection of dishes. At least, from what I remember, Hotel Excelsior’s Dulang Cafe used to serve good waffles and pancakes back then. Decades ago, by the way (yeah, I am that old). I know that Hill City Hotel near to Simpang Pulai serves high tea on weekends too (they still do, don’t they?) And I can only cross my fingers in anticipation of a preferably worthy outing. *By the way, Miner’s Arms in old town has reopened after some refurbishment works, and Kinta Swimming Club on Jalan Silibin offers traditional Western fares to the public. Just some random updates. Now I wonder when will FMS be done with the extremely lengthy renovation works …. three years now! 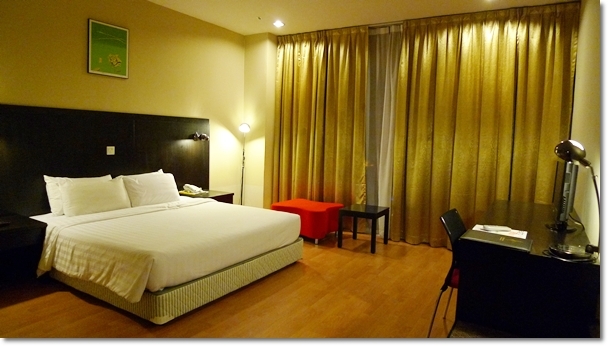 A deluxe room at Tower Regency Hotel – Go to their website for more information. This was about RM150/USD50 per night; for corporate/government rate. *By the way, the restaurant has a HALAL certification from JAKIM of Perak. You can view the certificate on their website. Shorter than usual post? Yeah …. sorry people. Just too caught up with happenings around here. Going back to Ipoh this weekend (yay!) and hopefully will make time for a brief food marathon around town. The list is perpetually growing. 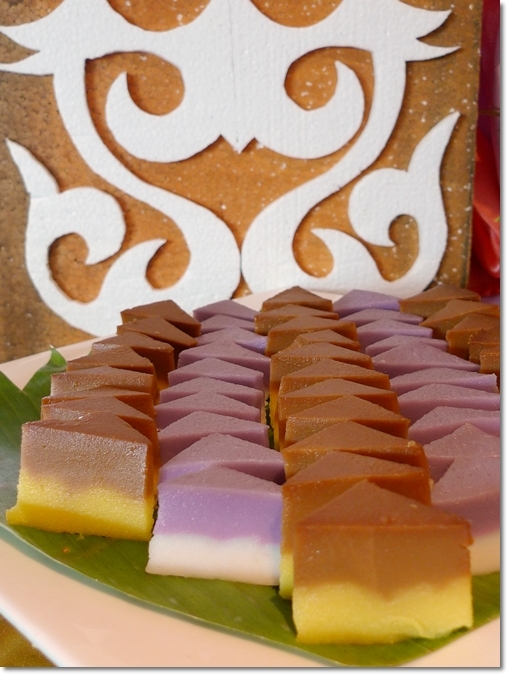 So where are YOU celebrating the arrival of 2011 in Ipoh? Miner’s Arm reopened? Same owner and modus operandi? Hi Bob, I am not sure about the same owner or not, but seems that the place has been revamped to a more bistro-like category. Though I can’t be sure until I visit the place myself. 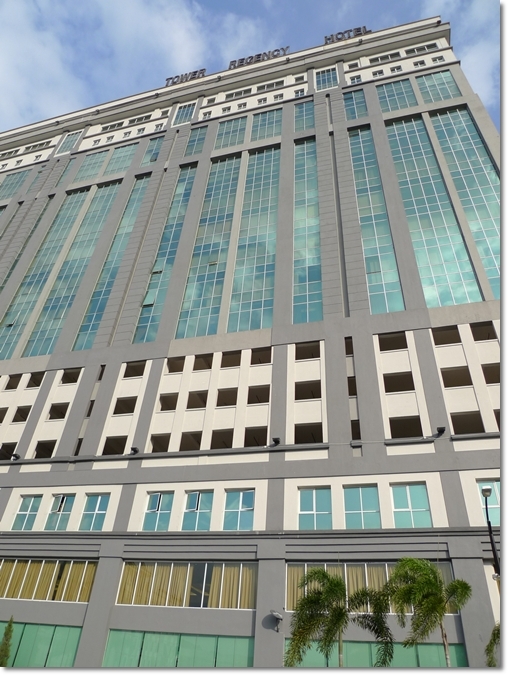 Tower Regency… well designed? It’s more like they had to work with what they had. It was originally built for offices, so, there are certain public areas that just do not seem quite right. Food-wise, sadly, hotel food outlets in Ipoh do not serve worthy buffets. 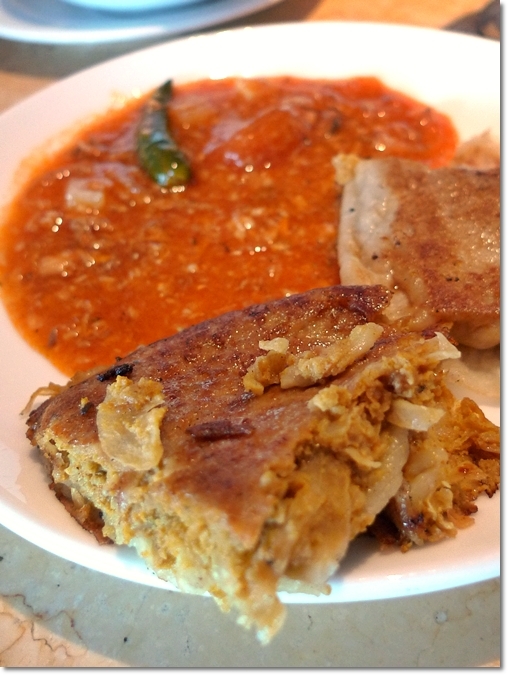 The murtabak pictured above looks sad! When are you going to try the murtabak from Goodshed which I vouched for some months back? Perhaps during your weekend food marathon? Hey! TLS actually I did try before I left Ipoh. Not bad, stuffed with meat and egg. But did not take any photos for that was a random breakfast. Well,… I suppose they did what they could for that amount of money (RM16 is too cheap, I guess?).. 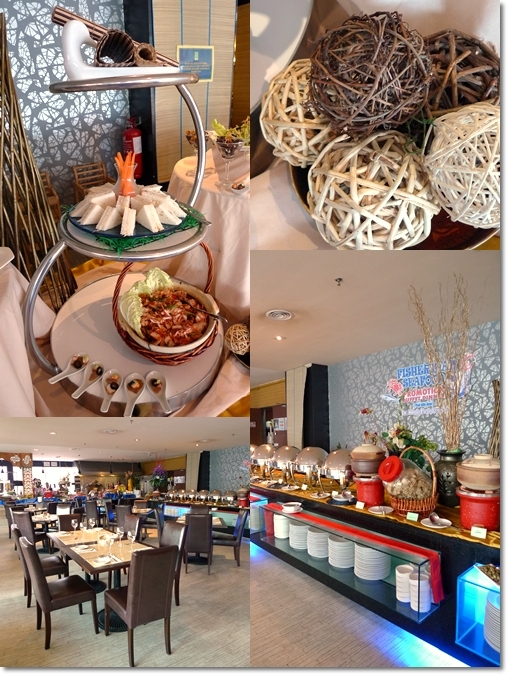 Beside Tower Regency there is a hotel called Regalodge serve set lunch at RM10++ i think….not bad, u can give it a try.. RM10+?!! That’s absurdly cheap. Very rare to find that price in Ipoh now. Haiyo, leftovers lai fun kenot be used lah cos it will turn slimey and semi translucent overnight if u take it out of the bag. Definitely not leftovers but can see that there are some “error” in the food preparation…. Seriously? Then maybe leftovers from the day’s lunch? Mind providing GPS coordinates to all your makan places? Hi Mikel, yeah I usually do with all the other posts. Just that Tower Regency Hotel has their own website, complete with contacts and address, that I neglected to do so. The last time we went there for Christmas Dinner waited so long for our dinner and guess what the chef was drunk…….and the surrounding area of the dinning was rather musky…not a very pleasant smell……wonder how is the interior now after the refurbishment???? Chef was DRUNK? Now that’s a new one. Probably he was a jolly good fellow, having a high time? Anyway, Miner’s Arms Bistro reopened with a launch late last year (2010). 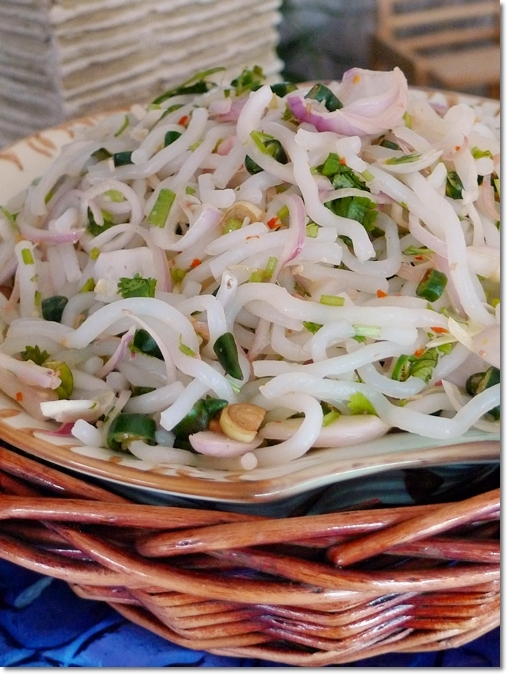 Now they have yet to feature main dishes in their repertoire, but soon enough as I was told. Now only beer snacks and of course, liquor. I actually stayed here on the first night the hotel opened, I think was 2 years back during CNY, and stayed again on a business trip. Big rooms and cheap but quality still lacked and the basement carpark is horrible! A RM16 buffet- I think I’ll pass and eat 3 bowls of pork noodles instead! 3 bowls of pork noodles. Ahem. Well said. Rooms are okay, clean and spacious with a touch of contemporary class. Just that parking’s no good and very dark. I’m so glad I found you. We’re planning a trip to Ipoh but the 2 hotels that you’ve recommended are way above our budget. Do you know of any newly opened boutique hotels in Ipoh, preferably with secure car park? Thanks!